Bob Hill met the Glidecoat team at the Stuart Boat Show, and he was very interested in getting his 35' Intrepid protected with our marine grade ceramic coating. Like many boat owners Bob was using traditional wax on his boat, and like many boats we come across, the gel coat was in very bad condition. Bob Hill met the Glidecoat team at the Stuart Boat Show, and he was very interested in getting his 35 Intrepid protected with our marine grade ceramic coating. The biggest challenge that every boat owner faces is keeping their boat clean. It is an ongoing struggle, with constant exposure to sun, salt, dirt, and rain. One of the toughest areas on any boat to keep clean is the non-skid. It is the area on every boat that collects the most dirt from constant foot traffic, while being the hardest to clean. 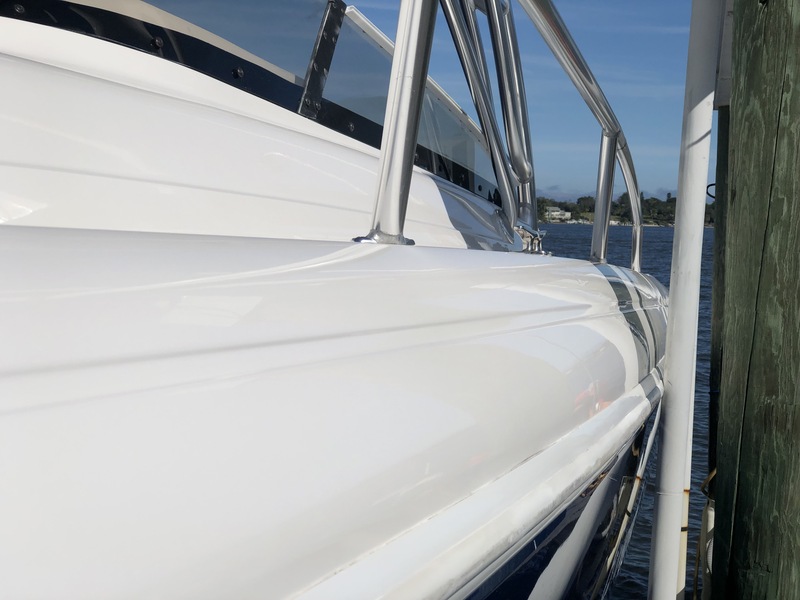 Bob wanted the entire topside of his boat coated with Glidecoat's ceramic coating, but his main focus was on the non-skid. Bob, and many other boat owners, ask us if our coating works on non-skid. And the answer is yes! It is a great solution to a common problem that everyone has, keeping the non-skid clean while also making it easier to maintain. While coating non-skid can help solve a lot of problems, there are some factors to consider before you proceed. The purpose of non-skid, as the name states, is to provide a non slippery surface for you to walk on. Applying a ceramic coating on non-skid won't make a noticeable difference when dry, but when wet, the surface can become more slippery, as the water will bead up instead of laying flat on the non-skids surface. This allows for easier cleaning, but can offer a potential risk of slipping when wet. The other major factor to consider when coating non-skid, is the amount of coating required to cover these areas. Due to the nature of non-skid surfaces, they are far more porous than flat fiberglass surfaces. As a result, this requires more coating to be used, which results in a higher cost to have the non-skid coated. The surface of the railing has extremely limited shine and visible oxidization. Gloss meter reading of 3.8 on the railing above the hull. 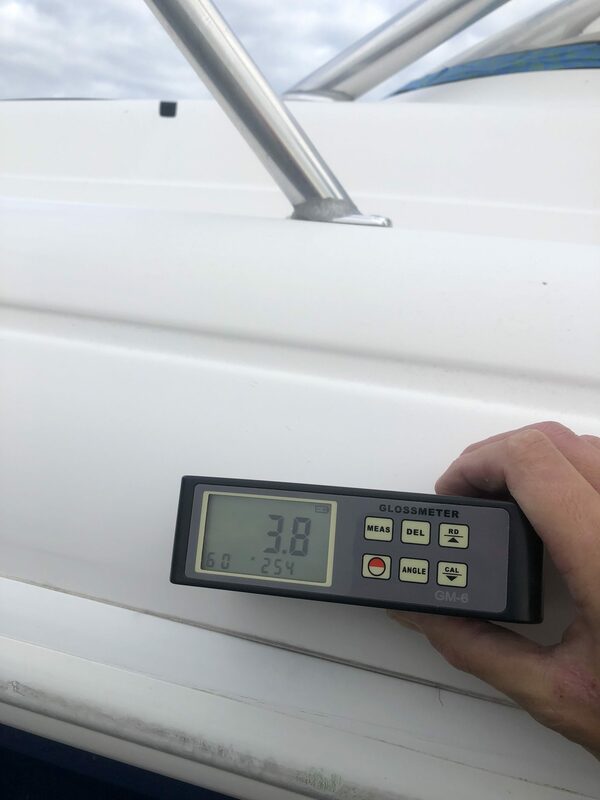 To provide a frame of reference, a brand new boat typically has gloss meter readings ranging from 80 - 88. Bob's boat had some of the lowest gloss meter readings that we have seen, with the lowest being 3.8. These extremely low numbers prove that an annual wax regimen, at least here in South Florida, is not effective enough to properly protect the surface from oxidization. Due to the amount of oxidization on the surface, we used a heavy cut compound and a wool pad as the first step. Following the heavy compound, our medium nano compound was used with a wool pad, finally followed with our nano compound and a foam pad. These three steps removed all the swirl marks from the surface while taking the gloss meter readings from single digits, all the way into the 80s! Once the non-skid has been prepped, we use our Surface Wipe decontaminate followed by one coat of our nano ceramic coating. The coating process is the same when working on non-skid compared to flat fiberglass, working in small 2 foot by 2 foot sections and hand buffing with a microfiber towel. More effort is required when buffing the coating into the non-skid, as the texture of the surface can make it more difficult to smooth out the coating while removing any excess. The finally result of Bob's boat exceeded everyones expectations, even ours! We started with a boat that was in extremely poor condition, with gloss meter readings as low as 3.8. 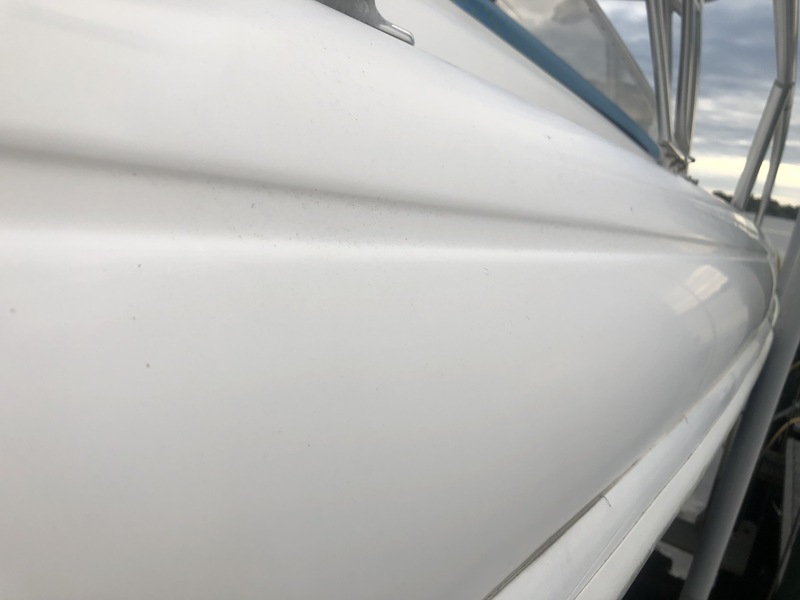 Once we finished with the Glidecoat restoration and coating process, we revitalized Bob's boat and were able to achieve gloss meter readings as high as 92.1! Not only were we able to restore an incredible shine to the gel coat, but we are providing superior protection to the surface, ensuring that the gel coat won't return to the dull, chalky state that we started with. 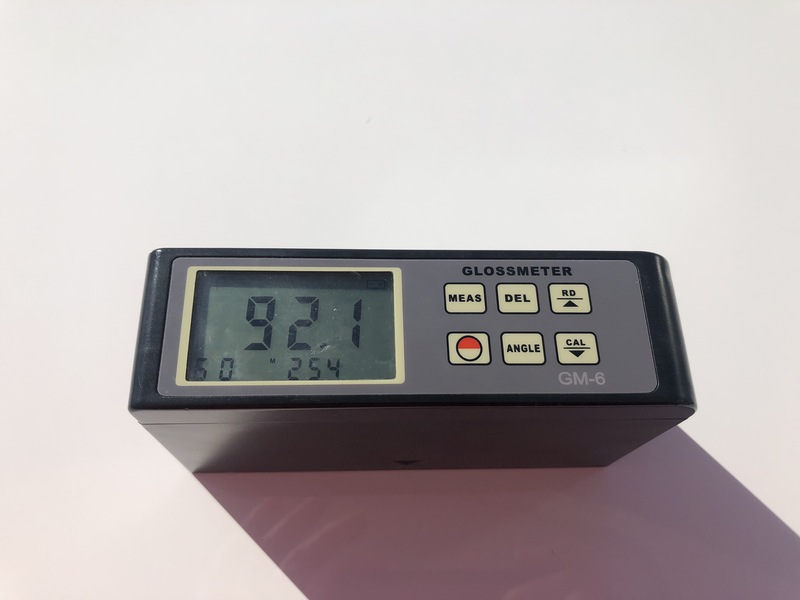 92.1 gloss meter reading after complete restoration and Glidecoat ceramic coating application. Great shine to the railing after Glidecoat ceramic coating application.